Habitat is a combination of food, water, shelter, and space arranged to meet the needs of wildlife. Even a small yard can be landscaped to attract birds, butterflies, beneficial insects, and small animals. Trees, shrubs, and other plants provide shelter and food for wildlife. The plants you use for food and cover will help determine the wildlife species attracted to your backyard. Nesting boxes, feeders, and watering sites can be added to improve the habitat. Planning is necessary for attractive and productive wildlife habitat. You have both a horizontal area to work with--the size of your lot--as well as a vertical area that stretches from your soil to the treetops. The vertical area is composed of the canopy formed by the tallest tree branches; understory vegetation consisting of smaller trees, shrubs, and vines; the floor which is often dominated by low-growing groundcovers; and the basement where a variety of organisms exist in the soil. Different wildlife species live in each of these zones, so numerous habitats can be provided on a small piece of land. Trees and shrubs are the backbone of any landscaping design and are important for wildlife shelter. 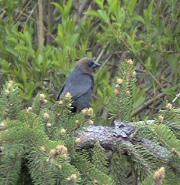 Many tree and shrub species are excellent sources of food for wildlife. Proper selection of plant material can meet both the aesthetic needs of the homeowner and the food and shelter needs of wildlife. Remember that you are part of the habitat! Condition of the plants and their locations. How much shade the trees and shrubs provide. Are trees evergreen or do they drop their leaves in the fall? Do they provide valuable food sources? 2. Make a sketch of your yard noting all existing plants, buildings, utilities, and pathways. You may even consider removing some plants. In some cases, trees have been planted too close to buildings or have grown much larger than the previous owner envisioned. Some species may be of little wildlife value and may not be particularly attractive. Once you have identified existing plants you want to save, start exploring options for plants that will work well with these species. The existing plants around your yard may be adequate to attract some wildlife, but a few changes can effectively enhance the existing habitat. Diversity in the landscape is necessary. Some plants provide food but very little cover; others provide cover but little food. 3. Add trees, shrubs, flowers, and groundcovers to your plan. Not all the planting needs to be done at once. If money or time is limited, consider it a work in progress. Eventual size. Whether they are evergreen or deciduous (trees that drop their leaves). Deciduous trees planted on the south side of a house will provide summer shade, but will not completely block winter sun. 5. Fill in with smaller shade-tolerant understory trees and shrubs. Adding these to an existing landscape will enhance the vertical structure that is common in natural landscapes. Many smaller trees and shrubs are colorful in the spring when they flower, and provide berries for fall and winter feed. 6. Flowering annuals (plants that live one growing season) and perennials (plants that live for more than a year) add color to the yard and can be added at any stage to attract birds and butterflies. If your yard is large, consider using part of it for tall native grasses that provide beauty, as well as a natural source of food and shelter. A native wildflower garden provides the same function. Even on a small lot, native wildflowers, as well as some common garden species, can provide attractive habitat for a variety of birds and butterflies. Avoid straight lines and perfect symmetry. Natural habitat has curves and clumps of vegetation. Wildlife is not particularly attracted to a well-manicured lawn. Wildlife is more likely to come out into the open for viewing when the boundary of the yard is designed and maintained as a retreat for animals. Food and cover are essential for the survival of all species. Loss of suitable nesting sites is a major factor in the decline of some bird species. In the wild, many species nest in cavities of dead trees. With the loss of hedgerows in some parts of the country and the removal of dead trees in towns, natural nesting sites are often limited. Also, some highly competitive, non-native species of birds have taken over some of the existing nesting sites once occupied by native birds. Bird species are extremely variable in their habits. Some like deeply wooded areas; others prefer open fields and meadows. Many species are year-round residents, while others such as the cedar waxwing appear only for a few days a year during migration. Other species such as sparrows, blue jays, cardinals, robins, juncos, and chickadees are highly adaptable and found in many environments. Many people are not aware of the value of dead, dying, and hollow trees, as well as logs on the ground, for birds and other wildlife. Dead trees provide homes to more than 400 species of birds, mammals, and amphibians. Fish, plants, and fungi also benefit from dead and dying trees. Consider leaving standing dead and dying trees in your yard unless they pose a human safety or property hazard, and use old logs and stumps in gardens and landscaping. Below are some plant species to consider for wildlife habitat. Check with a local nursery on plants suitable for your area. Some of these plants, while suited for wildlife, may have characteristics such as shallow roots or weak limbs that make them inappropriate for small urban properties--or they may not be winter hardy in all locations. Birds eat any flower seed, depending on the kind of bird and seed. Few yards will be able to supply sufficient food or shelter for a variety of birds all year long. However, you can improve shelter and food supplies by building or purchasing feeders and houses, and by setting out certain foods. All bird species have specific nesting requirements. Because of these requirements, your yard may not accommodate certain species. For instance, Eastern bluebirds prefer nesting sites that border open fields or lawns with a tree or fence post nearby to provide feeding perches. 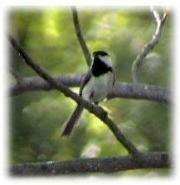 Chickadees prefer to nest in brushy wooded areas. Before setting out nesting houses, find out which species are common in your area and can be encouraged to nest in your yard. Make or buy a bird house specifically designed for the bird you wish to attract. The size of the entrance hole is critical to prevent the eggs and young from being destroyed by larger birds--always check a list of appropriate hole sizes. Other considerations include box size, height above the ground, direction the entrance hole faces, and amount of sunlight. Boxes may need baffles or other protective devices to limit access by cats and other predators. A good reference publication is "Homes for Birds" by the U.S. Fish and Wildlife Service, Office of Migratory Bird Management. It is available at two internet sites: http://www.fws.gov/r9mbmo/pamphlet/pamplets.html or http://birding.miningco.com/msub12.htm. Many species of birds can be attracted by a variety of feed in different styles of feeders. There are many styles of bird feeders available, from window-mounted feeders to those that hang from branches and stands. Many birds will readily eat right off the ground. Bird feed comes in a variety of choices; however, sunflower seeds appeal to many birds, as well as small mammals. Woodpeckers, nuthatches, and chickadees are especially attracted to suet. Citrus fruit, chopped apples and bananas, and raisins will be eaten by numerous species, including robins, titmouse, nuthatches, woodpeckers, and mockingbirds. Feeders may also attract wildlife species you may not want to feed such as starlings, crows, and squirrels. Feeder type and placement and the type of food can help deter unwanted species. Unlike many other species of birds, hummingbirds rely on nectar as their source of food. These tiny, migratory birds are commonly seen in the summer in northern states gathering nectar from colorful flowers. Hummingbirds are typically attracted to red and yellow tubular flowers, although they frequently visit others. Hummingbird feeders can be purchased and filled with a sugar-water solution, consisting of 1 part sugar to 4 parts water. Every 3 to 4 days, wash the feeder with soap and water, rinse thoroughly, and add new sugar water. Colorful butterflies and moths add beauty and interest to your backyard. There are hundreds of different species of butterflies and moths in North America. Butterflies and moths are insects. They hatch into larvae (commonly referred to as caterpillars), eventually become pupae, and develop into colorful adults. How long the process takes depends on the species and the climate. Butterflies and moths are amazingly particular in their food choices. The larval stage of the butterfly may require food quite different from that of the adult. Some larvae consume tremendous amounts of plant material, seemingly devouring plants overnight. A common example in the garden is the tomato hornworm which rapidly strips tomato plants of their leaves. An equally voracious, but beautiful, larvae is the Eastern black swallowtail which is found only on plants in the carrot family, including celery, carrot, dill, and parsley. A close relative is the Eastern tiger swallowtail that eats the foliage of wild cherry, birch, poplar, ash, and tulip trees. Adult butterflies require food in liquid form such as plant-produced nectar. They get some of it from flowers and from juices of extra-ripe fruit. The types of flowering plants you grow will determine the kinds of butterflies you attract to your backyard. In addition to the plants listed for hummingbirds, butterfly bush is especially attractive. Find out what species are common in your area and use plants they like. Nectar feeders can be placed in the yard to attract butterflies. Do not use insecticides near plants for butterflies. Learn to recognize larval and egg forms. That large green and black caterpillar eating your dill may one day turn into the gorgeous butterfly you were hoping to attract! Butterflies, like all insects, are most active when temperatures are warmer. While moths are commonly found at night, most butterflies are active on sunny, warm days. Butterflies will benefit from a basking site where they can warm up on cool mornings. Add a light-colored rock or concrete garden sculpture as a basking site. Butterflies also need a source of water. A shallow dish of water or a depression in a rock that retains water is all they need. In the United States, there are nearly 5,000 different species of native bees. Most of them are solitary, friendly bees that nest in holes in the ground or burrows in twigs and dead tree limbs. These bees do not have hives to protect them, so they are not aggressive and rarely sting. Bumblebees, carpenter bees, sweat bees, leafcutter bees, digger bees, and others pollinate many different kinds of plants. They play a critical role in healthy wild plant communities and gardens. About 30 percent of our diet is the direct result of a pollinating visit by a bee to a flowering fruit tree or vegetable plant. Providing bee habitat in your yard can increase the quality and quantity of your fruits and vegetables. Bees are extremely sensitive to many commonly applied insecticides. If you must use chemical insecticides in your garden, apply them in the evening when bees are less likely to be active. Bees are attracted to most flowering plants, and are especially fond of blue and yellow flowers. Try planting your garden to have different species blooming in the spring, summer, and fall. A good use for untreated scrap lumber (at least 3 to 5 inches thick) is to drill holes (from 1/8-inch to 5/16-inch in diameter) about 90 percent of the way into the thick wooden block. Space the holes about 1/2-inch to 3/4-inch apart. The 5/16-inch holes work best as homes for orchard bees which are excellent pollinators of fruit trees. Hang your bee blocks under the eaves of your house or garden shed, protected from direct sun and rain. Bats are a beneficial and interesting mammal. Bats are the single most important controller of night-flying insects, including mosquitoes, moths, and beetles. For example, a single little brown bat can catch up to 600 mosquitoes in an hour. Watching bats fly around light posts catching bugs can be an interesting nighttime activity. A bat house in your yard will help attract bats and provide them with much-needed roosting habitat. The house should be placed on a pole at least 15 feet high in a spot that receives sun most of the day. Tree trunks are usually too shady for bat boxes. Some bat species such as gray bats, red bats, and hoary bats will use shrubs and trees for roosting under loose bark or in cavities. Many species of bats migrate in the fall and hibernate throughout the winter months in caves, mines, or buildings. If disturbed during hibernation, their metabolism is increased, depleting fat reserves and reducing their chances of survival. As with all wildlife, bats should be watched, but not handled or chased. Generally, bats are shy of humans and will not attack or fly after a person. However, if caught or picked up from the ground, a bat may bite. Toads, frogs, lizards, turtles, and snakes all have a place in the backyard. While many people may not want some of these animals in their yards, most species are harmless and often quite beneficial--feeding on destructive insects or rodents. Shelter for reptiles and amphibians is easy to provide. Several rocks piled in a sunny spot will provide basking sites. Consider planting shade-tolerant groundcovers under trees and leaving a thick layer of leaves to provide cool shelter. Stumps, logs, and rock piles in a shady spot can be valuable. Clean, fresh water is as important to birds, bats, butterflies, and other wildlife as it is for people. Water in a saucer, bird bath, or backyard pond is adequate for wildlife. Be sure to change the water every few days to keep it fresh. In hot weather, it may be necessary to refill the container daily. Logs, rocks, and water-holding structures provide drinking and basking habitat for turtles, butterflies, and songbirds. Stones with depressions that collect water will help attract butterflies. Squirrels, chipmunks, rabbits, raccoons, opossums, skunks, woodchucks, mice, and deer are commonly found in many urban environments. These species are highly adaptable and, in many cases, are becoming unwanted visitors rather than welcome guests. As with all wildlife, cover is essential for the survival of these species. Small brush piles intended for amphibians and reptiles will also provide shelter for rabbits and mice. Chipmunks and woodchucks are adept at digging their own burrows. Trees may provide shelter for squirrels, raccoons, and opossums. Food set out for birds may attract many of these animals. Squirrels, chipmunks, and mice will readily eat birdseed. Raccoons will feed on suet. Woodchucks and rabbits will eat a variety of vegetation including garden vegetables and flowering plants. Deer are browsers and will nibble at trees, shrubs, hay, and grain. A few precautions can be taken to avoid unwanted encounters with these animals. Avoid setting out food that may attract scavengers such as raccoons. Keep garbage cans in a secure shed or garage or use metal cans that scavengers cannot chew through. Check the exterior of your house for loose or rotted boards that could allow access by mice or other rodents. Remember that these animals are wild, and if threatened they can bite. Raccoons can be particularly aggressive. All these species can carry diseases. Do not handle them. Laws vary from state to state on wildlife issues. If you have questions or concerns about wildlife, check with your state's Department of Natural Resources or Conservation Department before taking any action. Trees add beauty and so much more.